Jeona Zoleta is as every bit colourful and exciting as her art work. Upon meeting with her, I danced with her all night at a party. She was wearing a crisp waffle-knit jumper, with curious pink straps at the end of each sleeve. When I told her how much I liked it she told me it was a straitjacket, quite gleefully. Then I saw her work. The fusion of adorable and abject made perfect sense. 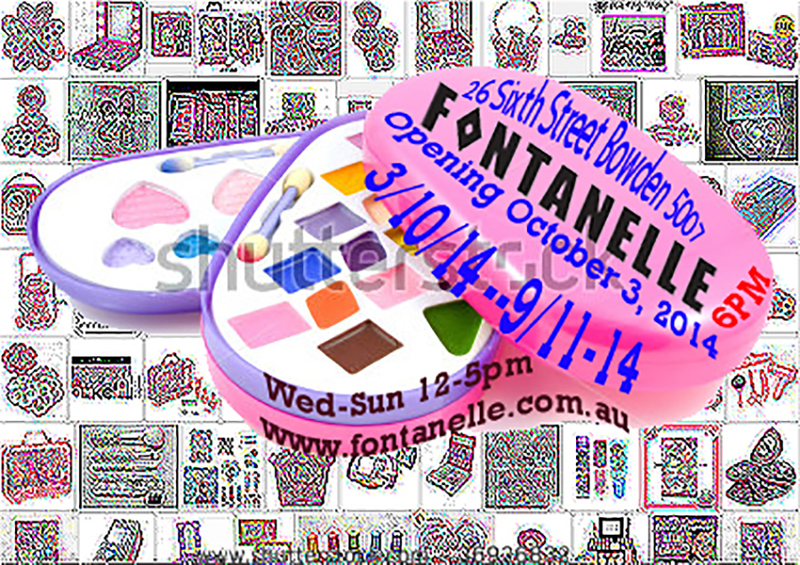 Her works are like dry swallowing an entire bottle of hundreds and thousands. Well not really. It’s better. And a bit slicker and more digestible than that. Each saturated painting is like a coloured Trojan horse, harbouring darkly humorous narratives among the playful splatters. There is a huge sense of joy in Jeona’s work – a hedonistic shopping spree. Jeona also engages directly with digitality, sometimes her pieces stemming from an image binge on Tumblr. Encompassing collage, painting, gifs, sculpture and installation, the works takes on forms of pop-culture indulgence, sexual narrative, sometimes centred on anime-babe heroines and girlhood icons such as unicorns, cherubs and mermaids and glorious neon colour. Jeona describes herself as a “Manila based unicorn”, her exciting aesthetic even extending to curatorial projects and experimental music. Her band in Manila have performed in immersive technicolour landscapes that Jeona has put together with her paintings and installation processes as well as inviting other artists to engage with and add to the space. Sound, lighting, performance and colour fuse together. Jeona enjoys what she calls the “unapologetic” nature of painting and the freedom to draw and paint her stories. In one of her 2014 paintings, Ghetto Glitterz Skiing In The Cyberstorm Spa, a cherry-ripe sweet little lass with tear-streaked cheeks is lost in the mountains. We see that she has just witnessed the full bloom of the phallus-flower. I really can’t help but think of the word ‘ski-poling’1. There is a sense of the perversive/subversive work of Greyson Perry, where dark narratives in a kitsch style appear on a familiar object, the vase, lathered with luxurious gold lustre. Even some autobiographical moments of Tracy Emin as Jeona’s performative pieces narrate the things she enjoys; revelling in icons of girly culture, colour and sexual excitement. Jeona’s aesthetic could be connected to the images of drug culture, the occasional irregularly shaped canvas adds to the trip. We chatted about her influences – we nattered about all things girly and colourful, in particular her absolute love for the work of Lisa Frank, an American business woman who fronts her eponymous sticker empire, responsible for colourful stickers of stylised pandas, kitty-cats and unicorns. Jeona describes her work as a bit like her sticker book; filled with all the cute images she collects, as well as a healthy dose of sexual energy. 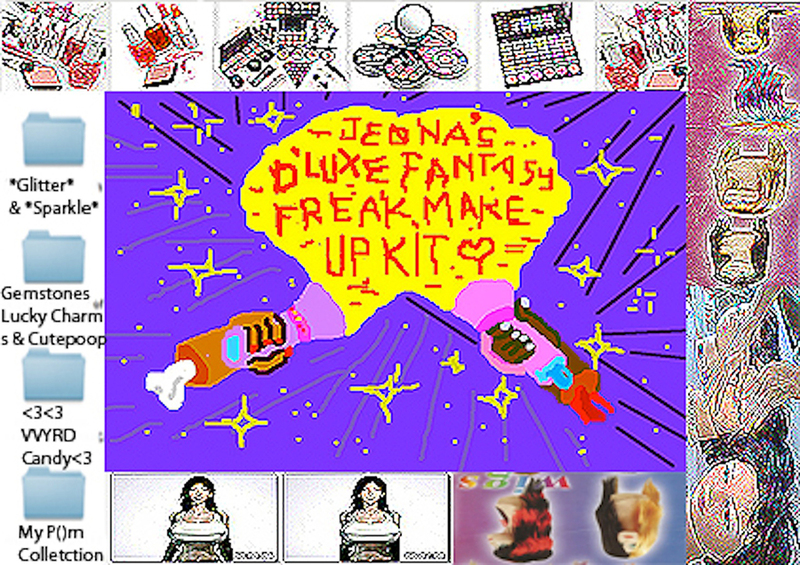 Her solo show at Fontanelle, fittingly titled Jeona’s D’Luxe Fantasy Freak Make-Up Kit, sees this little unicorn extend her horn into both spaces with tremendous ownership, filling them up with her colourful arsenal of treasures, even painting on the walls to envelope us in her world. Ski-poling is optional. 1 The act of giving two people handjobs simultaneously.